Throughout the engagement he was conspicuous by his bravery, and I took occasion, while still on the field, to refer to his excellent conduct. Thirty-one year-old Private Thomas Sullivan had little more than a year in the Army and E Troop, 7th Cavalry, at the time of the Pine Ridge Campaign. At Wounded Knee he demonstrated to his leadership his bravery and potential as a cavalryman. E Troop was taking effective fire from the Lakota that had sought refuge in the pocket of the ravine. Sergeant Nettles and Private Kellner were both shot in the head by Indians firing from concealed positions in the pocket, and Sergeant Tritle was wounded in the hand. Two of the troop’s horses were also killed. By all soldier accounts, E Troop was under a hot fire to which the officers and non-commissioned officers exposed themselves while placing soldiers on the skirmish line, directing their fire, and encouraging their men. One of the leaders in the troop called for two volunteers to advance nearer the pocket in order to gain a better advantage on the Indians firing from that position. Privates Thomas Sullivan and Mosheim Feaster readily took on the mission under the direction of Sergeant John F. Tritle, and were lauded by their commander that same day. Sullivan was soon after promoted to the rank of corporal. Wanting to ensure his soldiers were duly recognized for their actions on 29 December 1890 at Wounded Knee, the regiment’s sergeant major, Albert W. McMillan, who had served as one of the sergeants in E Troop at the battle, provided a sworn deposition at the end of March 1891 detailing Sullivan and Feaster’s actions. 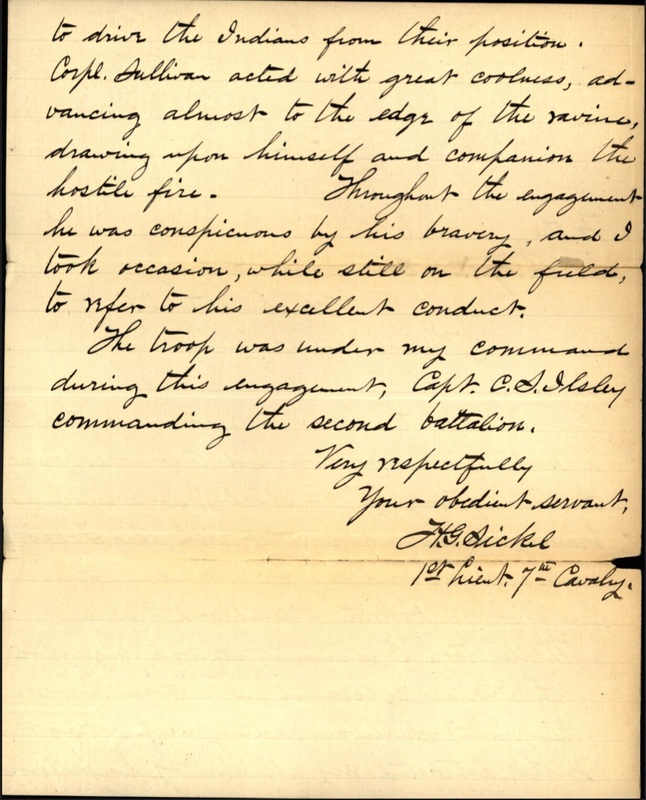 (Click to enlarge) Page one of Lieutenant Sickel’s letter detailing Private Sullivan’s actions. (Click to enlarge) Page two of Lieutenant Sickel’s recommendation. While Troop “E” (dismounted) was engaged with Indians concealed in a ravine, Corporal (then private) Sullivan, acting with Sergt. Tritle, attracted my attention by his endeavors to drive the Indians from their position. Corpl. Sullivan acted with great coolness, advancing almost to the edge of the ravine, drawing upon himself and companion the hostile fire. Throughout the engagement he was conspicuous by his bravery, and I took occasion, while still on the field, to refer to his excellent conduct. Assistant Secretary of War Lewis A. Grant approved the medal on 16 June writing, “Let the medal of honor be issued.” The medal was engraved, “The Congress to Private Thomas Sullivan, Troop E, 7th Cavalry, for bravery at Wounded Knee Creek, S.D., Dec. 29, 1890.” The Adjutant General’s Office mailed Sullivan’s medal on 23 June along with those of four other 7th Cavalry troopers to Fort Riley for presentation. (Click to enlarge) Assistant Secretary of War Lewis A. 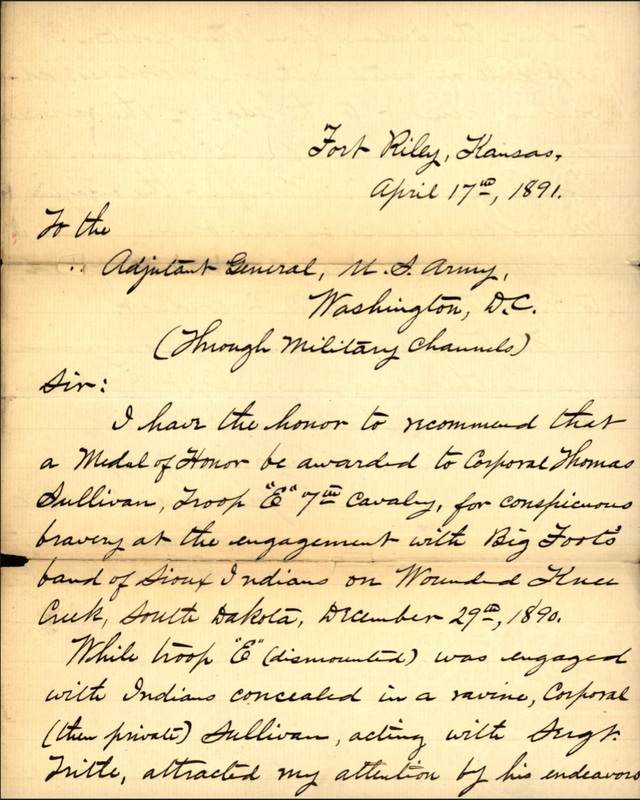 Grant approved Private Thomas Sullivan for award of the Medal of Honor on 16 June 1891. However, there is some discrepancy as to Thomas Sullivan’s year of birth. All of his military records place his birth year as 1860 or 1861, and his headstone has the year 1860 engraved. U.S. federal census data also disagrees inferring 1860, 1861, and even 1865 as the year in which Sullivan was born. The New York death index too infers 1860. A thorough search of Irish Catholic Parish baptismal records for those years indicates that Patrick and Bridget (Conolly) Sullivan were the probable parents of Thomas Sullivan. Less likely, but still plausible, is that he was baptized in the same parish on 10 July 1861, two years later, the son of Rich Sullivan and Mary McCann. Thomas Sullivan immigrated to America on the R. M. S. Chester in 1889. 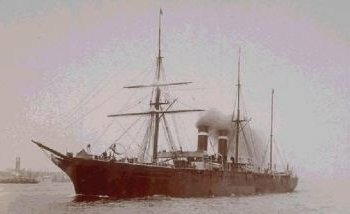 More certainly is that Thomas Sullivan, a twenty-eight-year-old laborer from County Meath, boarded the R. M. S. City of Chester in March 1889 at the port city of Queenstown, Ireland, and left his native land bound for the new world. He arrived in New York Harbor on the 30th and made his way to Newark, New Jersey, where six months later he enlisted in the Army for five years. His recruiting officer, Lieutenant Carter, recorded on 20 September that Sullivan was twenty-eight years and five months of age, stood five feet, nine and a half inches in height, and was a laborer born in Meath County, Ireland, with light brown eyes, dark brown hair, and a healthy complexion. The recent emigrant from Ireland was assigned to Captain Ilsley’s E Troop, 7th U.S. Cavalry posted at Fort Sill in the Indian Territory. Sullivan found his niche and served four consecutive enlistments in Troop E from Fort Riley, Kansas, to Fort Grant, Arizona Territory, and from Columbia Barracks, Cuba, to Camp Thomas, Georgia. In 1903 at the time of his fifth enlistment, Sullivan transitioned to Troop H, 2nd U.S. Cavalry, as a quartermaster sergeant and served his final decade in that unit serving in places like Randolph, Kansas, and Fort Des Moines, Iowa. Sullivan’s final tour was at Torrey Barracks on the Philippine Island of Mindanao before he returned with his unit to Fort Bliss, where he retired as the troop’s first sergeant on 3 June 1912 after over twenty-three years riding in a McClellan cavalry saddle. In addition to his Medal of Honor, his awards included the Indian Wars Campaign Medal and the Philippine Campaign Medal. Later he would also be authorized the Spanish War Service Medal, the Army of Cuban Occupation Medal, and possibly the Mexican Border Service Medal, each authorized by Congress after his retirement. (Click to enlarge) First Sergeant Thomas Sullivan retired at Fort Bliss, Texas, in June 1912. Following retirement from the Army, Sullivan returned to Newark, New Jersey, and married a fellow Irish immigrant named Ellen. Born in 1869, Ellen arrived in the United States at the age of eighteen and was a naturalized citizen. By 1915 Thomas and Ellen Sullivan were living at 357 South 12th Street in Newark where he was working variously as a watchman, a guard of a ship yard, and a policeman, eventually settling at 33 Brookdale Avenue. 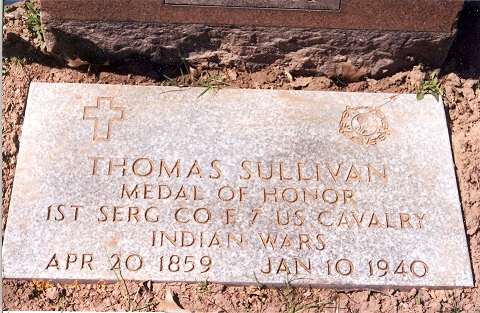 Thomas Sullivan, policeman, retired cavalry first sergeant, and recipient of the Medal of Honor, died on 10 January 1940 at Manhattan, New York. He was laid to rest in the Holy Sepulchre Cemetery in East Orange, New Jersey, next to his wife, Ellen, who had predeceased him in 1934. Coincidentally, buried in the same cemetery is another 7th Cavalry trooper and Medal of Honor recipient, Thomas J. Callan, one of the water bearers from the Battle of the Little Bighorn. 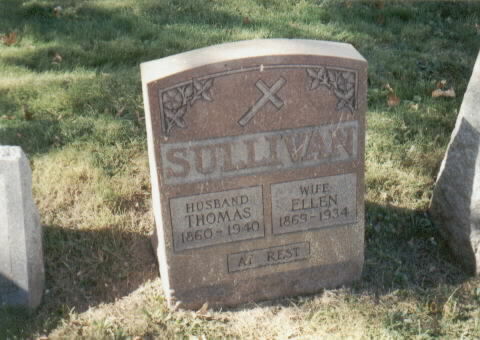 Thomas Sullivan and his wife, Ellen, are buried in the Holy Sepulchre Cemetery in East Orange, New Jersey. The Medal of Honor marker on First Sergeant Thomas Sullivan’s grave lists a year of birth different than that on his headstone. 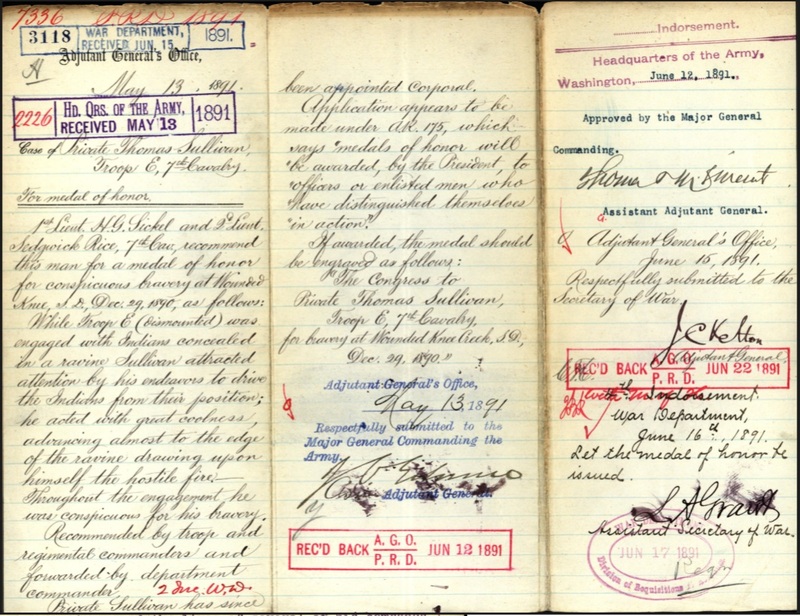 Adjutant General’s Office, Medal of Honor file for Thomas Sullivan, Principal Record Division, file 3466, Record Group: 94, Stack area: 8W3, Row: 7, Compartment 30, Shelf: 2; C. H. Carlton to Adjutant General’s Office dated 22 April 1891, Source data: The National Archives, Principal Record Division, file 6776, Record Group: 94, Stack area: 8W3, Row: 7, Compartment 30, Shelf: 3. Research conducted by Vonnie S. Zullo of The Horse Soldier Research Service. Ancestry.com, Ireland, Selections of Catholic Parish Baptisms, 1742-1881 [database on-line], Provo, UT, USA: Ancestry.com Operations, Inc., 2011 (Original data: Parish Registers. Dublin, Ireland: National Library of Ireland (NLI). The Milkcan Papers, “How Our German Ancestors Came to America,” Our German Immigrant Ancestors (http://www.milkcanpapers.com/franz.html) updated 24 Jul 2011, accessed 7 Feb 2015. Ancestry.com, New York, Passenger Lists, 1820-1957 [database on-line], Year: 1889; Arrival: New York, New York; Microfilm Serial: M237, 1820-1897; Microfilm Roll: Roll 531; Line:47; List Number: 358; Ancestry.com, U.S. Army, Register of Enlistments, 1798-1914 (National Archives Microfilm Publication M233, 81 rolls), Records of the Adjutant General’s Office, 1780’s-1917, Record Group 94, Year Range: 1885-1890, Surname Range: L-Z, Image: 443, Line: 588. Ancestry.com, U.S. Army, Register of Enlistments, 1798-1914, Year Range: 1893-1897, Surname Range: L-Z, Image: 343, Line: 516; Year Range: 1900, Surname Range: L-Z, Image: 197, Line: 705; Year Range: 1902-1904, Surname Range: L-Z, Image: 429, Line: 1549; Year Range: 1906-1907, Surname Range: L-Z, Image: 392, Line: 1407; Year Range: 1909-1913, Surname Range: R-Z, Image: 152, Line: 2009; Ancestry.com, United States Federal Census [database on-line], Year: 1900, Census Place: Pinar del Rio Barracks, Cuba, Military and Naval Forces, Roll: 1838, Enumeration District: 0108, FHL microfilm: 1241838; Year: 1910, Census Place: Torrey Barracks, Mindanao, Philippines, Military and Naval Forces, Roll:T624_1784, Page: 3A, Enumeration District: 0184, FHL microfilm: 1375797. “Sullivan Retired,” El Paso Herald (El Paso, Tx. : Editorial and Magazine, 14 Jun 1912), 6. New Jersey State Census, 1915, Sheet Number and Letter: 9A, Household ID: 205, Line Number: 10, GS Film Number: 001465523, Digital Folder Number: 005877707, Image Number: 00644; United States Federal Census, Year: 1920, Census Place: Newark Ward 13, Essex, New Jersey, Roll: T625_1037, Page: 5B, Enumeration District: 235, Image: 111; Year: 1930, Census Place: Newark, Essex, New Jersey, Roll: 1340, Page: 4A, Enumeration District: 0220, Image: 70.0, FHL microfilm: 2341075; Ancestry.com, U.S. City Directories, 1821-1989 [database on-line], Publication Title: Newark, New Jersey, City Directory, 1918, Image: 749; Publication Title: Newark, New Jersey, City Directory, 1925, Image: 741; Publication Title: Newark, New Jersey, City Directory, 1934, Image: 899. Ancestry.com, New York, New York, Death Index, 1862-1948 [database on-line], Death Place: Manhattan, New York, USA, Certificate Number: 1097; National Cemetery Administration, U.S. Veterans Gravesites, ca.1775-2006 [database on-line], Cemetery: Holy Sepulchre Cemetery, Cemetery Address: 125 Central Ave East Orange, NJ 07018; Peter Russell, “A Hero From the Wee County,” Men With Custer (http://www.menwithcuster.com/the-twenty-six-countries/a-hero-from-the-wee-county/), accessed 7 Feb 2015. Don Molfe, photo., “Thomas Sullivan,” FindAGrave (http://www.findagrave.com/cgi-bin/fg.cgi?page=gr&GRid=19718) uploaded 12 Jan 2003, accessed 7 Feb 2015. Ibid., uploaded 15 Apr 2006, accessed 7 Feb 2015. 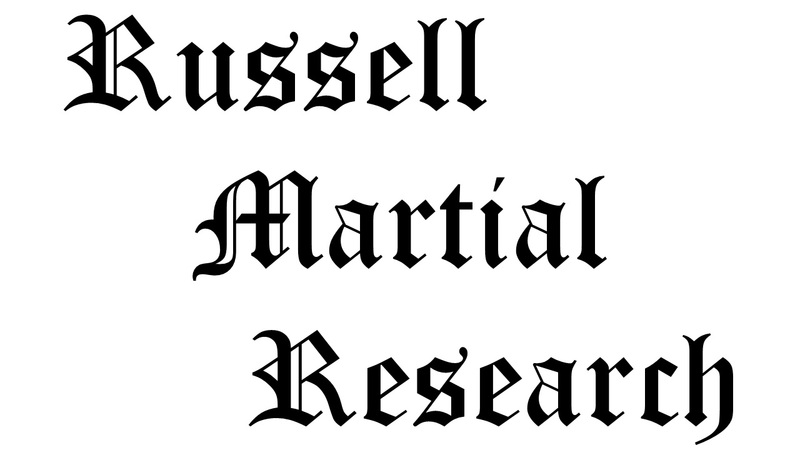 Citation for this article: Samuel L. Russell, “Irish Immigrant Private Thomas Sullivan, E Troop, 7th Cavalry – Conspicuous Bravery,” Army at Wounded Knee (Sumter, SC: Russell Martial Research, 2013-2015, http://wp.me/p3NoJy-HA), posted 7 Feb 2015, accessed date __________. This entry was posted in Award Recipients, Enlisted and tagged 7th Cavalry, 7th Cavalry Regiment (United States), Battle of Wounded Knee, Cavalry, Cavalry Troop, Lakota, Medal of Honor, Oglala Lakota, Pine Ridge, Pine Ridge Agency, Pine Ridge Indian Reservation, Sioux, Wounded Knee, Wounded Knee Creek, Wounded Knee Massacre. Bookmark the permalink. Sam: Another very well-researched and interesting biography. However, you have inadvertently referred to Thomas Callan as Thomas ‘Callahan,’ see http://www.menwithcuster.co.uk/ under ‘The Twenty-Six Counties ‘ page to which a link has been added to your own website. You’re doing an excellent job, which is much appreciated. Sam: Clearly I missed your Note 11 above. Thank you for including my website as a source. Peter… Thank you for catching my misspelling of T. J. Callan’s last name and bringing it to my attention. I have corrected it and several other oversights. Your excellent website is now referenced in note 12 above.